Haven’t been posting here for a long time, sorry about that! Will work on upkeeping the site a little more. Anyway, I’m happy to announce a few shows that will be happening along the year. These are some of the confirmed shows. Will update more along the way. More details on the way. So do stay tuned! I hope everyone is well. The past 4 months had been a seriously off-the-charts busy period for me. January to March 2016 was a mix of private functions, jam sessions, big band show, concerts with WVC (ours own and with others) locally and out-of-town, arranging horns for several album recording sessions, my teaching classes (both privately and in UCSI) and others. It was just non-stop! April showed a bit of slow down, with the end of the semester in university, a short holiday with the lady, and performing with the MPO, a George Gershwin & Leonard Bernstein programme, aptly named RHAPSODY IN BLUE. I have a few days off before May arrives. May 1st (Sun) : International Jazz Day Jam Session @ Bobo KL. 6pm onwards, no cover. May 2nd (Mon) : NBT Jam Session w/ WVC. 9pm onwards, 2 drinks minimum charge. May 8th (Sun) : WVC “DO NOT GO GENTLY” album launch. 1pm. Starmount Studios. May 19-22nd (Thu-Sun) : WVC & KLPac presents Shakespeare & Jazz – “If Music Be The Food Of Love, Jazz On.” 8:30pm & Sunday 3pm, Pentas 2, KL Performing Arts Centre. May 22 (Sun) : MJQ (Malaysia-Japan Quartet) @ No Black Tie. 9pm onwards, RM60 cover. May 27-29 (Fri-Sun) : World Lindy Hop Day – KL SEA Jam (music by WVC). 7pm. May 31 (Tue) : WVC featuring Nadia @ Geographer’s Cafe Jonker Walk. 8:30pm. That’s it for May…June’s also going to be a killer month, but more on that soon. Hope you can make it to some if not all the shows! See you! ANNOUNCEMENT: WVC Presents…WAITING FOR THAT DAY, A Live Concert. WAITING FOR THAT DAY : A Live Concert! 10 piece String Ensemble Arioso Sinfonia, Calligrapher Tan Guet Bee , Videographer Tan Choo Harn, Photographer Wong Horng Yih, Dancers led by Sae Min. Sentul Park, Jalan Strachan, Off Jalan Ipoh, KL . *All inclusive RM 3 ticket handling fees. 20% discount for purchase tickets of two day shows. Note: Ticketing will start soon, but in the meantime, you can also contact us with enquiries via our hotline number (014-6445592) or email us at wvc.bookings@gmail.com. We hope you can come and support us at our concert this year, and we’d love to see you all there. We look forward to have you enjoy the show as much as we’d enjoy playing for you. Meanwhile, we’d like to personally thank each and every one of you for the support you have shown us over the past few years! If you didn’t know already, Johor Bahru (south of West Malaysia) will be having its inaugural jazz festival this weekend, from the 26th Feb until 1 March 2015 . This festival is organized by the same group of people that organized the annual JB Arts Festival (10 years and running!). As you can see, there will be some notable artistes, both local and overseas, who will be performing there. I’m proud to say that I will be part of the David Gomes Jazz Ensemble & Junji Delfino, and will be performing on the opening day of the festival, 26th February. We’ve got an awesome line-up of musicians: David Gomes (vocals & piano), Junji Delfino (vocals), Patrick Terbrack (tenor sax), Eddie Wen (trumpet), Hanafie Imam (bass), Shawn Kelley (drums), and of course, yours truly on alto sax. I’m looking forward to this festival, and it will be an awesome hang with some friends, and also loads of fun music to play. If you’re around the hood, we hope to see you there. If not, make a trip down over the weekend and join us for a weekend of fun. This is our band, WVC TRiO+1’s first public performance of 2015! This will be the first of many to come, and we are planning ahead for a major project that will happen in the middle of the year. So do stay tuned to our updates, as we will be bringing you more stuff, from podcasts, live performances, miscellaneous project updates, and more. Follow our band on Facebook – WVC TRiO+1 and on Twitter @WVCTrio. As for this weekend, we will be performing in this intimate space in PJ SS2, Toccata Studio, at 3pm. It’s a great time to spend your Sunday afternoon, especially for those with families who would not have much opportunities to check out our evening/night shows. WVC TRiO+1 Live at Toccata Studio! Venue: Toccata Studio, 19b, Jalan SS2/55, 47300 Petaling Jaya, Malaysia. Date and Time: 11th Jan 2015 (Sunday), 3pm. Drawing inspiration from the many facets of modern life, influenced by Malaysian and other Asian cultures, the music of WVC TRiO +1 cuts across many musical genres and defies any kind of classification. Tunes such as “The Art of the Wind Up Alarm Clock”, “Found and Lost”, “Standing in the Rain on Euclid Avenue” tries to examine and express the human condition in modern life, using the art form known as “jazz” as its stylistic musical vehicle. Formed in 2006 as a trio, WVC TRiO +1 completed its quartet line up with the addition of saxophonist Julian Chan. The group has toured extensively in the region, heralding back the spirit being “on the road” of touring jazz bands of old. Through these regional tours, WVC TRiO +1 has brought its music to many corners of Malaysia, Singapore, China, Taiwan, Thailand, and Macao. In one of these tours, the quartet managed to travel extensively over 18 cities within a month, using different means of transportation, playing in many different types of venues. WVC TRiO +1 has three instrumental albums – “WVC TRiO” (2008), “ELEVEN” (2009), “In the Dark, I See Her” (2011) – that explored different musical genres (while maintaining the spirit of jazz as its core) and combinations in its line-up. Most of the tunes recorded are original tunes written by the band members. In addition, the band also experiments with transforming unlikely pop tunes, Chinese classics, and many mainstream music into new jazz re-arrangements, in the spirit of the great jazz musicians of old. WVC TRiO +1 has been invited to appear in many festivals in the region such as Taichung Jazz Festival, Kota Kinabalu Jazz Festival, Phuket International Jazz Festival, Tianjin International Jazz Fest, Macao International Jazz Week and many others. In addition, the band has played extensively in the Malaysian local jazz clubs, from No Black Tie, Nero Fico, (the now defunct) Venue, and many others. 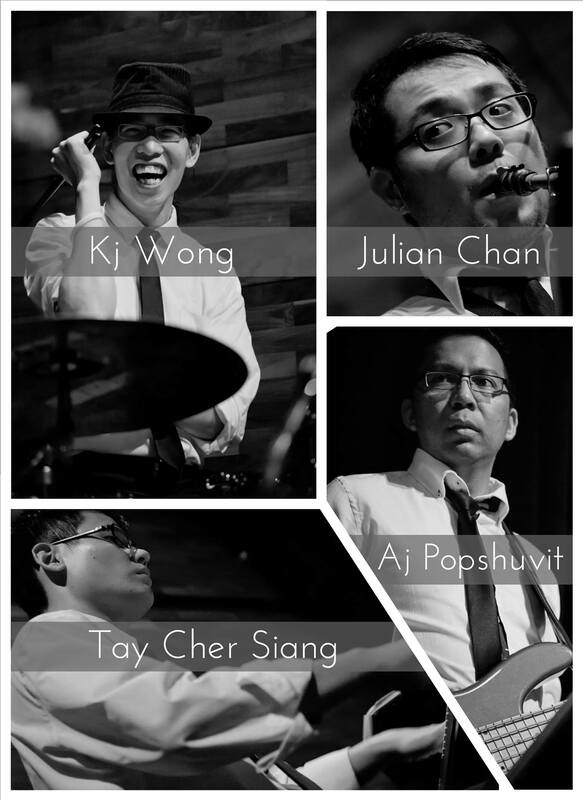 The present incarnation of the WVC Trio + 1 consists of bandleader/composer/arranger/music director/pianist Tay Cher Siang, bassist AJ, drummer KJ Wong and saxophonist Julian Chan. The band remains one of the most active units in the Malaysian performance circuit and is one of the most sought after bands in Malaysia for Hi-Fi recordings and live performances. Call/text 016-3618504 to reserve your seats now! Hope to see you at the show! Support live music and jazz in Malaysia! 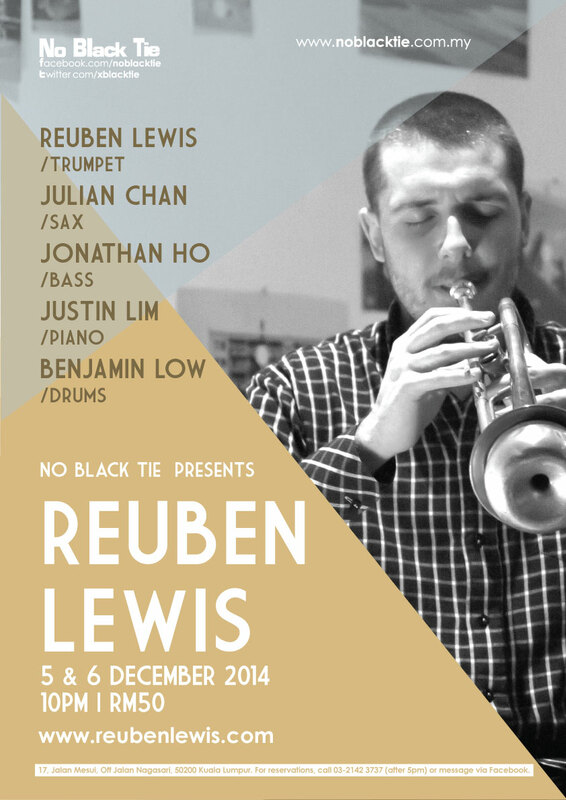 I’ll be performing with Australian jazz and experimental trumpeter REUBEN LEWIS with my quartet this weekend on Friday (5th Dec) and Saturday (6th Dec) at KL’s premier jazz club NO BLACK TIE. This time around, my quartet will feature our original pianist JUSTIN LIM, and two of my friends BENJAMIN LOW (drums) and JONATHAN HO (bass). Trumpeter, composer, improviser, and a driving new force in the Australian Jazz and Experimental music community. Reuben is a graduate of The Australian National University with Honours (1st class) in Jazz Performance and Composition. In 2012 he relocated to Berlin, where he established lasting artistic roots and toured through Sweden, Poland and Germany. Since returning to Australia in 2013, Reuben has permanently relocated to the city of Melbourne, where he performs regularly in a plethora of musical outfits. In Australia, Reuben has performed with his own ensembles at established festivals and concert series such as Jazzgroove, The Now Now Spontaneous Music & Experimental Film Series, Sound Out, Canberra International Music Festival, Capital Jazz Project, SIMA, MJC, MIC, MIUC, Jazz at the Gods Café, Lebowskis, Woodford Folk Festival, Womadelaide World Music Festival and the Wangaratta Jazz Festival. His current performance projects include the likes of established Australian musicians James Greening, Ronny Ferella, Miroslav Bukovsky, Geoff Hughes, David Tolley and Jordan Murray as well as emerging artists Luke Sweeting, Joanathan Heilbron, Callum G’Froerer. As a composer Reuben has written for short film, classical ensembles, pop/alternative bands, reggae/roots/folk outfits and jazz/experimental/improvising ensembles ranging from solo to big band. He has been commissioned to compose educational work material for schools, has appeared in the Australian Jazz Real Book – Vol. 1 and was a finalist in the 2010 Sprogis Woods Jazz Composition Competition. In both 2009 and 2011, Reuben received funding from the Friends of the School of Music as well as ArtsACT (2011) to release two albums – Samadhi, Fractured Spring – of original music under his own name. His third album, featuring a Berlin-based free improvised trio and electronic post-production artist, will be released in early 2014. As a collaborator he has appeared on several albums, such as The Goose is Loose – Dub Dub Goose, People and Lightbulbs – The Luke Sweeting Sextet, Live @ Alchemia Bar, Krakow – SVELIA and Trio – Praetzlich/Beierbach/Lewis (pending release in 2014 on gligg-records.com in Germany. Reuben is a co-leader of the The Phonetic Orchestra, a contemporary music ensemble that has received a JUMP mentorship grant to collaborate with acclaimed artists Peter Knight, Jim Denley, Dale Gorfinkel and Eugene Ughetti in 2014. Hope you can make it this weekend. It’s definitely going to be an interesting and fun musical experience, something a lot more different than what most of us are used to. See you this weekend! Support live music and live arts in Malaysia! I’m glad to announce that I will be part of a short tour (Singapore-Hong Kong-Singapore-Paris-London) for a few concerts with Jeremy Monteiro and his Asian Jazz All-Stars Power Quartet (subbing in for their regular sax player, Tots Tolentino, who is taking a break at the moment) from the 6th till the 22nd November. The last show for me on this tour will be at UK’s most premier jazz club, Ronnie Scott’s, for the London Jazz Festival! Can you tell I’m psyched?? I’m really looking forward to this trip – to learn and to play with these amazing musicians – Jeremy Monteiro, Hong Chanutr Techatananan and Eugene Pao! Thanks in advance, Jeremy and gang! 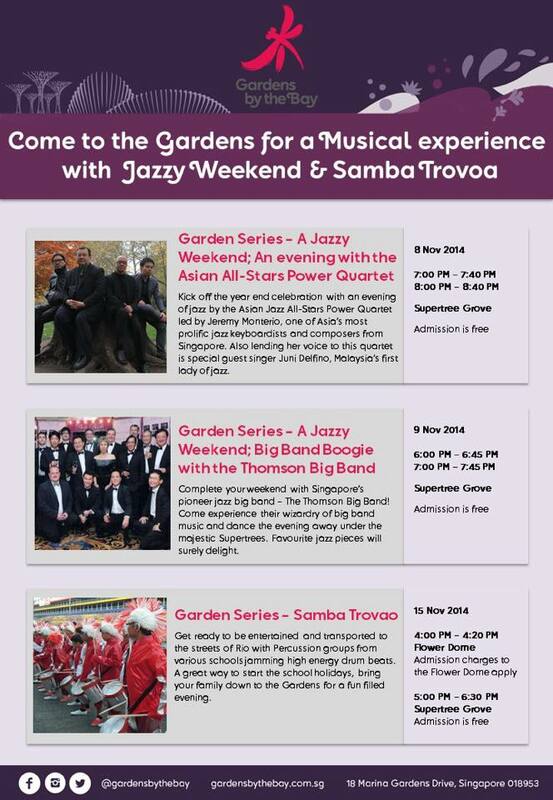 This show will also feature our Malaysian-ised Jazz Mamma, JUNJI DELFINO, singing with us at this beautiful garden park in Marina Bay Sands. We are playing two sets, from 7:00-7:40pm and 8:00-8:40pm. Admission is FREE. So, if you are around the area, or some of you happen to be in Singapore for a trip, please do come by and check out the show and say hi to the band. We’d love to see you there! STAY TUNED FOR MORE UPCOMING TOUR SCHEDULE UPDATES! July is a crazy month of sorts for me, something I definitely consider a blessing (since I know it can be quiet for some, in this auspicious fasting month….Selamat Menyambut Ramadhan, my Muslim friends!). 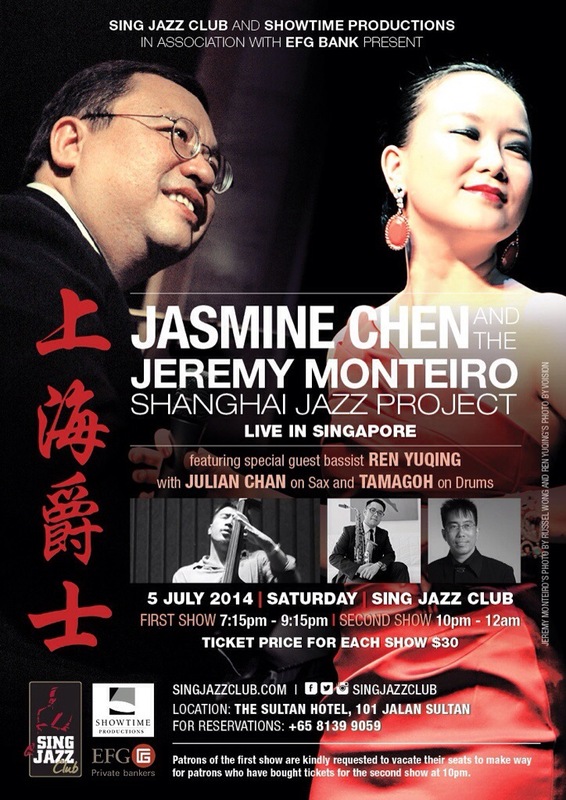 JEREMY MONTEIRO & JASMINE CHEN: SHANGHAI JAZZ PROJECT (with Tama Goh on drums, Julian Chan on saxophones and special guest Ren YuQing on bass). I’ll be performing tomorrow night, July 5th, at the newly launched SingJazz Club (formerly known as Sultan Jazz Club) with Jeremy Monteiro and Jasmine Chen for the Shanghai Jazz Project. There will be two shows, one at 7:15pm and one at 10pm. Ticketing details are as written in the poster and also the event page. To my SG friends or my other friends in SG, if you can make it, I would love to see you there.